I am frequently on the low end of the chic-food curve; it can take me a while to get out of my usual cooking ruts. So until recently I had never tried the garlic scapes that have been increasingly available in American farmers’ markets and gourmet shops. 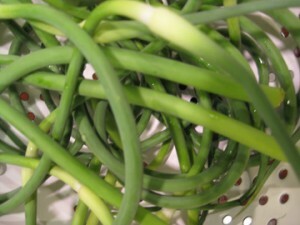 Scapes are the stalks that come out of garlic bulbs. They are clipped off in June by farmers who want the plants to send all their nourishment to the bulbs of garlic. Since I have only seen scapes for the last few years I have a feeling many garlic farmers formerly used them for compost. They now sell them, and the curvy stalks are a boon for garlic lovers. Visiting the Alexandria, Virginia, Farmers’ Market the other day with my mother I found scapes at the stall of Twin Springs Fruit Farm. This Pennsylvania farm travels a couple of hours from home to sell its wares to suburbanites in the D.C. area. My mother and I were just discussing what the heck we would do if we bought the scapes when we spied a recipe leaflet from Twin Springs devoted to them. Emboldened, we picked up a half pound of scapes and went home to make the first suggested recipe, scape pesto. Since I can never leave a recipe alone I changed the one I was given slightly: I cut down on the olive oil (Twin Springs suggests a full cup, and you may want to try that) and added a few nuts plus a little butter and salt. My family members found the scape pesto a little too bold when we tried it on crackers. We are nearing the end of the season for scapes, which become more garlicky as they ripen. We remembered while watching True Blood later that evening that our breath would easily protect us from vampires, but vampires are scarce in our area so we didn’t really need the extra pungency. The pesto was just right used sparingly on pasta, however. The scapes’ flavor resembles that of garlic but is somehow greener—a little sharp but lovely blended with the cheese. My brother remarked that the pesto reminded him of a fresh Caesar salad. Twin Springs also suggests using scapes in a stir fry or an omelet—anywhere, in fact, that you might use garlic. The farm tells shoppers to cut the scapes into 1- or 2-inch pieces and parboil them before sautéing them. What my family liked best about the scape pesto (aside from the flavor) was its color—the true green of early summer, especially a rainy early summer like the one we’ve been enjoying on the East Coast. Next year I’ll start buying scapes earlier and try other recipes. This year we Weisblats are enjoying our pesto. 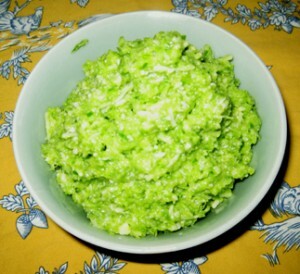 In a blender or food processor combine the chopped scapes, nuts, salt, and olive oil. Process until the mixture is blended but not completely pulverized. Pour the mixture into a bowl, and blend in the melted butter and cheese. Taste the pesto and adjust any ingredients you like. Makes 2 cups (plus!) of pesto. Sunday was Father’s Day and I was in Virginia so I decided to spend a little time with the Father of Our Country at Mount Vernon. I have always felt a kinship with George Washington. My grandmother kept a statue of Washington in a niche next to her front stairs in Rutland, Vermont. As children we were required to salute “General George” every time we passed it. I had visited Mount Vernon several times before. I had never been to Washington’s gristmill, a few miles down the George Washington Parkway, before. The sunny day, a little cool for June in Virginia, provided the perfect occasion for my first trip there. Myriad tour buses were piled up outside the main mansion at ten in the morning, but the gristmill had a smaller crowd. Manager Steve Bashore, interpreter Travis Shaw, and their colleagues had plenty of time to explain the workings of the mill. They also shared a bit of history about the site with visitors. In the 1760s Washington showed he was ahead of his time as a southern agriculturalist by changing his main crop from tobacco to wheat. The reasons were threefold. First, as students of American history know, tobacco quickly depletes nutrients in the soil. Washington was a pioneer in composting and crop rotation, but even so he must have had trouble with this difficult crop. Tobacco is also extremely labor intensive; indeed, its cultivation is one of the reasons the American South became so dependent on slavery. Finally, in the 1760s tobacco from the future United States had to be sold through British tobacco merchants. These traders paid colonial planters in luxury goods rather than cash and could not secure a guaranteed price. Washington was frustrated with this system, in which he generally lost money. 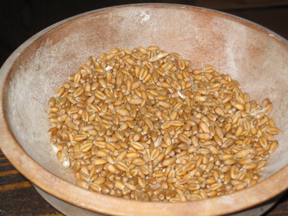 When he changed over to wheat and other diversified crops he was able to sell to more markets, rotate his crops, and increase harvests (wheat could be planted twice a year). In 1771 he added to the profitability of his grains by opening a mill so that he could sell not just the raw agricultural products but also the edible commodities they became. Visiting the gristmill reminded me what a smart man Washington was. He had a clear vision of an American economy that integrated agriculture and industry. As the interpreters were quick to point out, the gristmill represented not only a brilliant agricultural move on Washington’s part; it also looked ahead to the coming industrial revolution. In 1791 Washington became the third person to purchase an innovative milling system designed by Oliver Evans, one of our nation’s first patent holders. The water-powered Evans mill enabled Washington to mechanize every part of the process of milling grain—moving the grain into storage, cleaning it, grinding it, cooling it, and sorting it. By the mid-19th century the Evans process had been replaced by operations that were bigger in scale, and the mill built by Washington fell into disrepair. It was eventually torn down, and its stones were used for new construction. 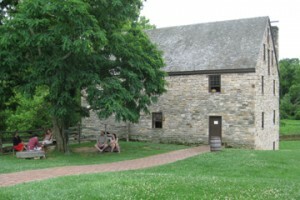 In 1932 the site was acquired by the Commonwealth of Virginia, which reconstructed the mill and the miller’s house on the original foundations in honor of the 200th anniversary of Washington’s birth. In 1997 the state decided that Mount Vernon could take better care of the structure, which was then restored. The extensive renovations included a reconstruction of the Oliver Evans mill, which I saw in action on my visit. It is apparently the only such mill working in the country today. Steve Bashore, who runs the mill, is eloquent about both of the passions that brought him to Mount Vernon—history and milling. He spends much of his time trying to make the mill more efficient. He also spends much of it perusing records at Mount Vernon that can illuminate the day-to-day workings of the mill in the late 18th century. 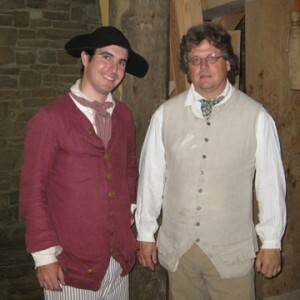 Steve has plans to make and sell new products soon at the mill, including grits and a pancake mix. 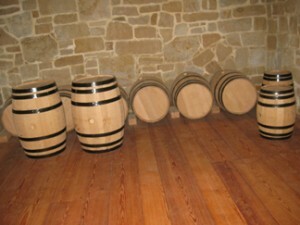 (He also hopes to sell rye whiskey from Washington’s distillery next door!) I intend to return when those are available. 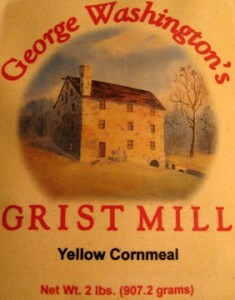 In the meantime I was able to purchase some of the mill’s yellow cornmeal at the gristmill’s gift shop. 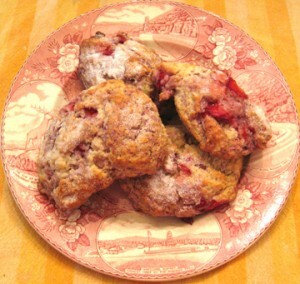 Yesterday I used it to make one of George Washington’s favorite dishes, hoe cakes. 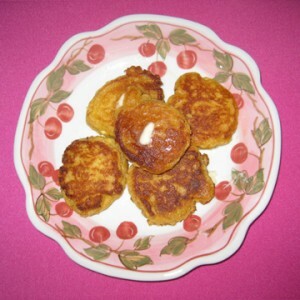 Hoe cakes are pancakes made of cornmeal mush. They supposedly got their name from the fact that African-American slaves (who were usually allocated a ration of cornmeal as part of their diet) would sometimes prepare them on fires using the flat part of a hoe. 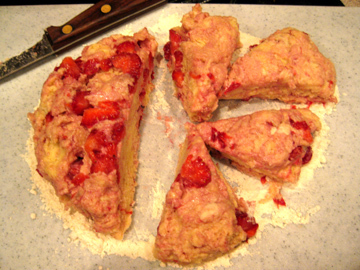 The web site goes on to provide a “modern adaptation” of this recipe, which is served at special occasions at Mount Vernon. It didn’t sound terribly appetizing to me, but I thought I would try it—until I read a post on Mount Vernon’s blog, penned by an anonymous member of the Mount Vernon education department. The blogger indicated that Washington probably ate his hoe cakes “swimming in butter and honey” because the darn things were completely unpalatable! So I did what any self-respecting 21st-century Daughter of Our Country would do and altered the recipe. Actually, I pretty much just threw it out. My hoe cakes resembled traditional pancakes, incorporating a bit of white flour and using baking powder instead of yeast for leavening. And they were really, really good served with a little ham and vegetables. I promise I’ll try the traditional Washingtonian version some day when I feel braver. In the meantime, I hope you enjoy these hoe cakes. If you have a dietary objection to bacon fat you may of course fry them in a little butter instead. The bacon fat was historically appropriate and sinfully tasty, however. In a medium-sized bowl combine the cornmeal, flour, salt, baking powder, and baking soda. Whisk until the mixture is integrated and smooth. In a small bowl (or measuring cup) whisk together the buttermilk, melted butter, and egg. Make a well in the middle of the dry ingredients, and pour in the buttermilk mixture. Stir just until the mixture is moistened, adding a little more buttermilk if needed to give the batter the consistency of thick pancakes. In a heavy frying pan or skillet heat a tablespoon or two of bacon fat. When it is good and hot, add the hoe cake batter in little mounds of 2 tablespoons each. Fry for a couple of minutes on each side, adding more bacon fat if needed. Keep finished cakes in a warm oven while you cook their relatives. Make sure the hoe cakes cook through as the batter is thick. Serve “swimming in butter and honey.” (Actually, they’re not bad on their own.) Makes about 15 hoe cakes. 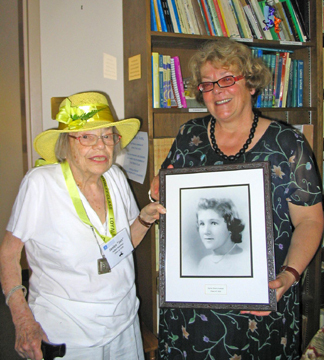 I recently accompanied my mother to her seventieth reunion at Mount Holyoke College. 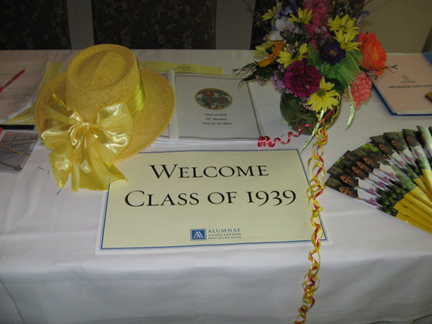 Watching the parade of alumnae—beginning with the Class of 1934 and ending with the Class of 2009–was inspiring. From the old ladies remembering their youth to the young girls looking ahead to their prime, these women in white exuded confidence, humor, and joy. 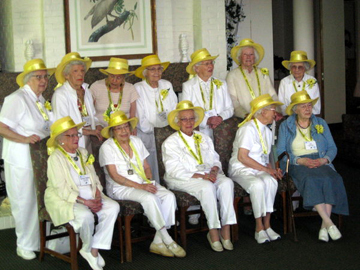 The college made a great fuss over the Classes of 1934 and 1939, who enjoyed their moment in the sun. My mother particularly loved the hour or so we spent at the French department open house. There graduating seniors and returning alums mingled with faculty and staff. At the open house I met up with one of my Mount Holyoke professors, Nicole Vaget, who still radiates passion for French history and culture. While we were chatting with Madame Vaget (even years after graduation it took me a while to call her Nicole) we noticed two signs of my mother’s time at Mount Holyoke on the wall of the French department library. One was a plaque dedicated to her beloved professor Paul Saintonge. Paul and his wife Connie took my mother to France for the first time the summer after her freshman year in college, introducing her to the country and the language that would be her favorites. She still speaks of him fondly. The subject of the photo was indeed her friend Sylvia Delight Sherk Hubble, who died in 1993. Her family established a memorial fund in her honor, and the college remembers her daily with this picture. 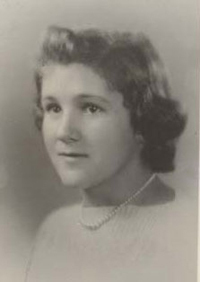 My mother made many close friends in college, but Sylvia may have been the closest. She lived up to her middle name and was a delight all her life. The daughter of missionaries (she led missionary children out of Iran at the onset of World War II), Sylvia wasn’t the smartest or the most ambitious of my mother’s friends. She was without a doubt the most lovable. She had a childlike enthusiasm for life that was infectious. When she and my mother got together they were transformed into young girls. My mother would announce, “And now Sylvia Sherk will give her famous hog call,” or, “And now Sylvia Sherk will stand on her head.” Sylvia would comply, and they would both giggle. They probably didn’t help each other learn a lot of French in college. But they obviously taught each other a lot about friendship. Sylvia’s marriage to Harry Hubbell, a physicist, made her friends from college a little suspicious. 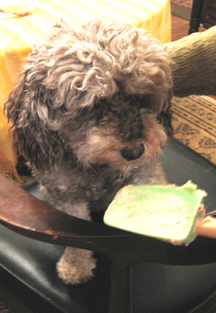 They were won over by Harry’s gentle demeanor and his devotion to Sylvia, however. The pair enjoyed hiking, camping, and skiing together and hated to be apart. On a visit to my parents’ home in the 1980s, I recall, they ended up sleeping in a single cot in the guestroom when issued separate beds. “I got lonely without Sylvia,” Harry explained the next morning. When I was in graduate school at the University of Tennessee, Sylvia and Harry often invited me to their small house in Oak Ridge. There they enjoyed community and church life, bird watching, and their garden. Sylvia wasn’t the world’s best cook, but she brought her sense of fun to everything she created in the kitchen. I recall the company more than the food during those visits in which she and Harry served as my Tennessee “parents.” Nevertheless, one item she baked stands out in my memory because of its vivid color. 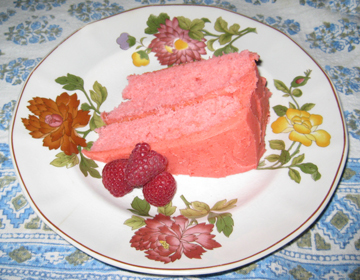 One spring afternoon Sylvia brought to the table the most garish cake I had ever seen. It had one green layer and one orange layer. She explained that she had created it with a cake mix and two different flavors of gelatin. It tasted better than it looked although it was very, very, very sweet. 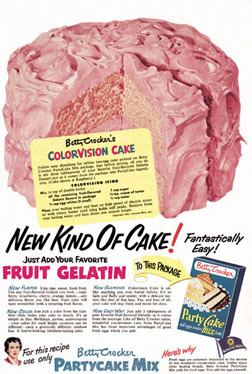 Years later, when I was corresponding with nutritionists at Betty Crocker about something the company advertised on television in the 1950s, I obtained the recipe for “Color Vision Cake.” This must have been more or less the formula Sylvia used. In her honor I recreated it last week. I decided that the single flavor of gelatin in the recipe was probably enough. I also modified the icing slightly, adding more butter and less sugar than the folks at Betty Crocker suggested. It came out a perfect 1950s pink, not unlike the hue of my grandmother’s appliances and bathroom tiles. Despite its hint of artificial flavor the cake was a hit, particularly with the young and with those who were young at heart like the delightful Sylvia. I hope that you eat it with lots of milk and fresh fruit (to cut the sugar)—and that you think of someone you love as my mother loved her Sylvia. That affection is a tribute to the lasting friendships nurtured in places like Mount Holyoke. Preheat the oven to 350 degrees. Grease and lightly flour the bottoms (only) of 2 8- or 9-inch round pans. (The 8-inch pans work a little better.) Measure out 3 tablespoons of the gelatin for the cake; save the remainder for the frosting. Mix the cake according to the package directions, adding the 3 tablespoons of gelatin. Pour the batter into the prepared pans. Bake the cakes until a toothpick inserted into the center comes out clean; this should be 27 to 32 minutes for 8-inch pans and 25 to 28 minutes for 9-inch pans. Cool the layers in their pans on a rack for 10 minutes. Run a knife around the sides of the pans, and gently remove the cake layers to a wire rack. Cool them completely (about 1 hour). To make the frosting, melt the butter. Beat in the gelatin, a splash of milk, and enough confectioner’s sugar (and perhaps additional milk) to make it spreadable. Ice the cake. Serves 10. The solstice is just around the corner, and I had one of my first tastes of the forthcoming season the other day. 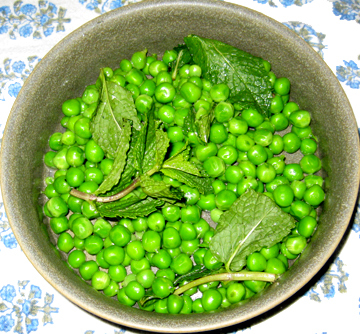 My sister-in-law Leigh returned from the Farmer’s Market with heavenly fresh peas! I eat frozen peas in the winter with a fair amount of grace, but I think of them as a completely different vegetable. It’s lovely to savor the real thing once again. 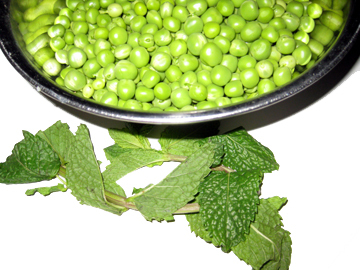 Knowing that mint is a traditional accompaniment to peas we whipped up these buttery minted green pearls. Cooking time may vary slightly depending on the freshness of your peas. With luck they will be super fresh and take very little time. Crush the mint leaves a bit (a mortar and pestle do this best, but a fork in a dish will work) to release their oils. In an 8-inch frying pan melt the butter. Add the drained peas and the salt and pepper, and cook for 2 minute, shaking or GENTLY stirring. Throw in the bruised mint leaves and cook for another minute, again mixing carefully. Place the peas in a bowl and serve. Garnish with fresh mint if you like. Serves 4. By the way, we have a winner for this month’s book drawing. Anthony Daniel of East Haven, Connecticut, has won the memoir Never Trust a Thin Cook, courtesy of the University of Minnesota Press. Congratulations, Anthony! A new drawing will be announced in July.